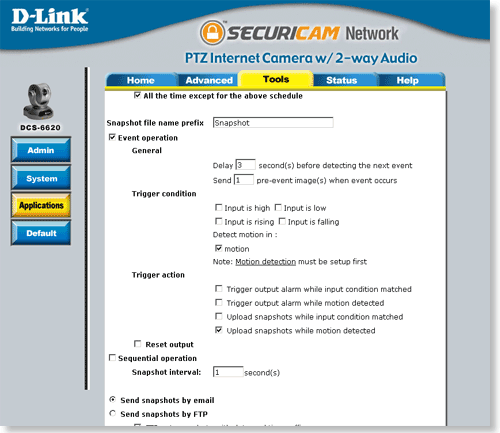 Step 1 Log into your camera through the web interface. Step 2 Select Configuration on the left. Step 3 Click Motion Detection on the left. Step 4 Click Enable Motion Detection. 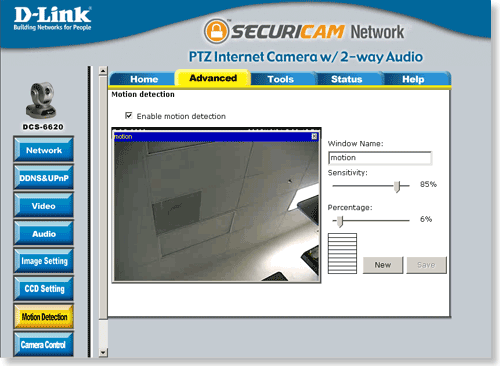 Step 5 Click New and resize the motion detection window. Click the Window Name box and enter a name. Next, set sensitivity and percentage. Step 7 Go to Tools and then select Applications on the left. Step 8 Select your desired schedule. Note: If you wish to set the schedule of motion detection for every day, select All the time except for the above schedule. Step 9 Click Event Operation. Step 10 Select the motion window(s) you would like the event to watch. Step 11 Select the trigger action. Step 12 Once you have selected the proper trigger action, choose where snapshots will be sent to, Email or FTP.